Perhaps because of recent news events, the November film schedule is looking a little barer than expected (Death Wish and Polaroid have been excised to another year), but the big hitters have remained: a Pixar film, two superhero meet-cutes, and a pair of sequels to films about moms and dads that bring the older generation into the equation, kicking and screaming. Then there is the rest. You're living in the decade when all-purpose blockbuster filmmaking has been replaced by supermen cinema, and nothing about this year will break the cycle. This month, a Marvel superhero team-up leads the way, with a DC superhero team-up also on schedule for a little variety. We begin with Thor: Ragnarok, which has contrived to be the 17th (out of 17) Marvel Cinematic Universe film to be rated "Fresh" on Rotten Tomatoes (that's not a compliment). This is a record of critical success envied by, for starters, Martin Scorsese, Alfred Hitchcock, and Steven Spielberg. Who knew Marvel films were that good? 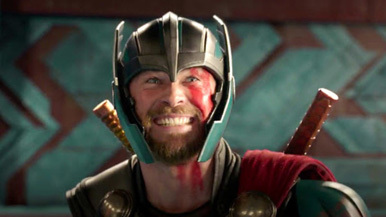 A lot of people liked the first two Thor movies, but it looks like a whole lot more of them are going to like Ragnarök, which, basically, is Scandinavian for "Apocalypse", a title that gets no disagreement from me. The smart thing about the film is that it plays like a two for the price of one, bringing in not just Thor but also Bruce Banner, known on late and lonely nights as the incredible Hulk, a beloved comic book grandee who has been "tragically" absent from the big screen since his exile in Avengers: Age of Ultron (as the Hulk flew away in his little rocket ship, tears were shed). Cate Blanchett is Hela, another evil deity pushing for control of Asgard, and one who must be congratulated for her unholy existence, because she has gotten credit as the Marvel Cinematic Universe's first leading female villain (you get your kicks where you can, I guess). Tessa Thompson takes over from Natalie Portman as the female lead, a warrior queen, Jeff Goldlbum will offer wry commentary as the sadistic entertainment mogul Grandmaster, and Tom Hiddleston's tireless fan-favorite Loki will get another few moments in the sun (say, didn't Thor promise the puny earthlings that Loki will go to Asgard jail for his many murders? As far as I can see, a glowing prison jumpsuit is not part of his outfit). Taika Waititi, helmer of several crafty and near budgetless New Zealand films, takes over directing duties, and the returning cast also includes Idris Elba reprising gatekeeper Heimdall, and Anthony Hopkins as Odin, whose record of governing and keeping his land in order has been decidedly mixed since roughly 2011, when these films began (Asgard just isn't great anymore, sadly; the invaders are pouring in). The film also arrives with a big advantage that its schedulers may or may not have planned for: Just like Stephen King's It, Thor 3 has the good fortune to open after many weeks of under-performing box office, and a collection of titles that have largely been ignored, looked down upon, or downright mocked by most audiences (October is the only month of 2017 not to carry a $100 million earner). Thor finished with $181 million the first time and $206m the second, while the Hulk has starred in two films of essentially equal box office ($132 million in 2003, and a scary-twin $134m in 2008). Here, he is teamed with a fledgling Marvel hero in what has been marketed as essentially a buddy film. Understandable, though for Thor's new best friend, I would have picked, say, Freddy Krueger, Chucky, or Jigsaw. Be honest, does the world really need another superhero? The Distinguished Competition (as Marvel calls DC) brings out its own brand of Avengers-style comic book hero enjoin-ment, and a film that should be neck-and-neck to win this November (in fact, by placing it second, I've probably made the wrong choice, but this sentence nicely hedges my bets). The Justice League are a sturdy bunch, but this team's ace in the whole is Gal Gadot, of course, who carried Wonder Woman as the biggest film of the summer, though still only the second biggest of the year (Beauty and the Beast will hold that spot until those Star Wars fans start pouring into the theaters in December. Incorrigible). As the year has progressed, Gadot's performance, character, film, and off-screen demeanor have all melded to elevate Wonder Woman to a status as an icon, and Justice League's advertisements surely go to great lengths to market her existence. This is especially because, unlike most of the Avengers, three members of the Justice League will receive films only after, not before, this big team-up venture. One such newcomer to the franchise is The Flash, briefly glimpsed in a few beforehand films, and played by Ezra Miller, star of dark independent cinema like Afterschool and We Need to Talk about Kevin, and of the comparatively cheerier The Perks of Being a Wallfower, for which he's perhaps still best known. Also joining are stage actor Ray Fisher as the appropriately pseudo-mechanical Cyborg (with a solo film due for 2020! ), and Jason Momoa, a B-movie alumni if there ever was one (he remade Conan the Barbarian in 2011, growls and all), as the beloved Aquaman, whose 2018 headlining feature recently wrapped production (I ain't kidding when I issue my daily criticisms of superhero abundance). Ben Affleck returns as Batman, and one can sensibly deduce that Henry Cavill's Superman will venture back from the dead at some point between now and the next sequel (just like horror movie villains, superheroes never die. Really, the only difference is that horror villains are cool, and don't open their films to ridiculous numbers, Pennywise excluded). Despite his inevitable comeback, and unlike, say, Star Trek III: The Search for Spock, Justice League hasn't been marketed as a journey to save Superman - Supes has been absent in at least the trailers I've seen, and even after a thorough examination, I couldn't find on him on any of the 28 posters on Impawards, although one of them hints at the outline of his cape (or maybe I'm just seeing things), and he could be playing Where's Waldo somewhere in the pixels. Justice League was initially directed solely by Zack Snyder, though Snyder stepped away because of personal reasons, with post-production duties going to Joss Whedon, a more cult-friendly filmmaker who directed my favorite Marvel Cinematic Universe movie, Avengers: Age of Ultron (...no, I'm not trolling). Also not much seen in the ads is the villain, Steppenwolf, played in some form by Ciarán Hinds, and perhaps lacking the brand name recognition of the DC Universe's two fairly skinny-looking bigger evils, Lex Luthor, who shows up here somewhere, and the Joker, who seems to have passed on harassing the Justice League this time. Steppenwolf is some sort of space warrior-king, like Thanos, the constipated-looking galactic being who's been idely threatening to attack the earth for almost a decade now in the Avengers universe. Whatever you say about his looks, manners, or personal life, at least Steppenwolf is getting right to the point. 2017 is the second year with two Pixar films, after Inside Out and The Good Dinosaur paired up and sowed evil upon the land in 2015. Cars 3, which I thought was a successful entertainment, finished with $152 million earlier this year, and now Pixar delivers what is expected to be the much bigger film. That is Coco, which has a title that can mean almost anything, and probably induces giggles if repeated out loud often enough. It has a plot that vaguely recalls the 1986 horror film Trick or Treat, wherein a young boy (voiced by Anthony Gonzalez) follows his favorite musician, now deceased, to the land of the dead, where he gets to meet and chat around with any number of his ancestors (from a genealogical point of view, I find that fascinating). Coco takes as its inspiration Mexico's Day of the Dead, which plays out from October 31 to November 2, as a partner holiday to the Celtic Samhain (now known as Hallowe'en). Indeed, the film goes all in to its Mexican setting, delivering fiesta music and a lively visual palette of dark colors in its joyous underworld. Coco opens on the Thanksgiving Wednesday beloved by animated juggernauts like Tangled, Frozen, and Moana, and also by Pixar's own The Good Dinosaur, an underrated film whose total will surely be toppled by this one, not least because there's a cute dog on the poster. Now, just as my horror film forecasts often grow long, pedantic, and textured with the lovingly-detailed history of the genre, my forecasts for CGI films tend to be short, blunt, and increasingly repetitive of each other (indeed, the quality of my animation write-ups can be summed up with the joke, "the food was bad, and in such small portions"). My CGI prediction formula is clear and easy: I tend to point out that the film appears to be funny; that it is receiving good reviews, or will do; that the cast includes some well-chosen voice performers, perhaps pleasant to the ear (Gael García Bernal, Benjamin Bratt, the inevitable dose of John Ratzenberger); and that it will probably make a lot of money. Pixar films inspire more than a few of these observations, and Coco should have no problem checking every box on my list. The sister (!) film of a Bad Moms Christmas, with the fathers of the fathers arriving to show us exactly where and why its lead characters' personality deficiencies were cultivated (facial physical resemblance is optional). Both Daddy's 2 and the Bad Moms sequel are set around Christmas, of course, and both plot the course of opening in early November, with the idea of playing deep through Thanksgiving and then sticking around for a full month into December 25th, if they can. The story begins as before, with Will Ferrell the sincere and unmacho stepfather to the children of no-nonsense vulgarian Mark Wahlberg. What happens next is unsubtle but not unfunny, as the two arrive at the airport, where they greet Mel Gibson, who as Wahlberg's father is burly, brusque, and manly, and then John Lithgow, a tall, smiling, and friendly dandy who is inevitably revealed as the father of Ferrell's character. (Would reversing the personalities of the parents have worked a little better? Not sure). So nurture makes nature. John Cena is still around as Wahlberg's new wife's ex (I and everyone else would have cast The Rock), and Linda Cardellini long-suffers as Ferrell's spouse, who rarely gets a good line. Jokes may repeat themselves: as before, characters #1 and #2 badmouth character #3, before the camera reveals #3 sitting right next to them. These people get to the point. The first Daddy's Home opened with $15 million on Christmas day and finished with something ridiculous - $150 million! - yes, a number exactly ten times its first. Some were puzzled, as some are, but to me it made perfect sense: films geared at, and featuring, families released in mid to late December are a natural to sow box office gold (see Cheaper by the Dozen, say). And while Daddy's Home was not wonderful, it must be given credit for attracting those respectable numbers even against the ginormous Jedi juggernaut that unduly assaulted theaters that month. Perhaps December was a better release date again this year, especially with Coco threatening to arrive a few weeks later. Nevertheless, these fathers, stepfathers, and grandfathers will begin their feuding early into the season and hope to bicker all the way to late December's end; by which time I think their theater counts will fall, as cinema owners clear off as many screens as possible for the December 15th opening of that film I dearly wish not to see.